On Wednesday, April 25th, poet, author. and photographer Charles Smith, Jr. visited with the 2nd, 3rd, and 4th graders of our school. He started the presentation with a school photo of himself in the 8th grade, and went on to describe how he became who he is today - after aspiring to be an astronaut! 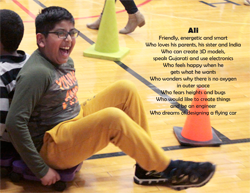 Our students have begun their own “I am…” poems, modeled after his two books I am America and I am the World. The Haggerty Library has many of the books he has written, so please check them out! April is Poetry Month and because of Friends of Haggerty we were able to celebrate poetry in a big way with this visit by Charles Smith, Jr.!